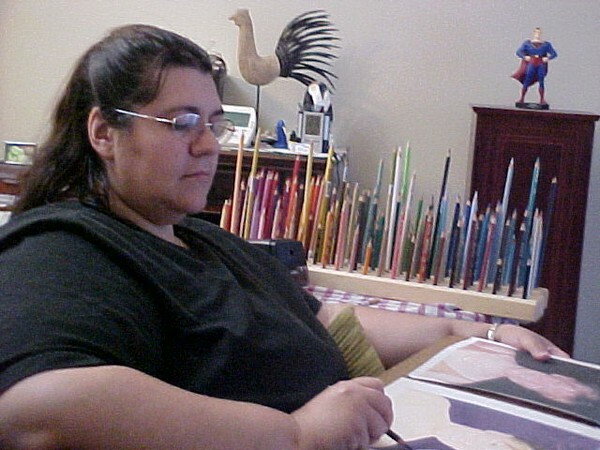 My husband, Anthony Tirolese, took some photos of me while I was working on a portrait. This is where I often sit in our living room so I can be close to the family. Today my husband was playing his guitar while I worked on this portrait. The pencil holders you see by my left elbow (there are two identical pencil holders) were made for me by my good friend:Yves Bureau. The photo does not do them justice. They are beautiful and absolutely wonderful to work with. If you look behind me you will see one tiny framed ACEO by Jenn Nilsson. On my phone table, by the stylized rooster, you will see a wonderful rock sculpture of a penguin and its baby (cannot see it because the clock pencil holder is in the way) created by the wonderful and talented Corry Stuart. She was kind enough to give this as a gift to my son, Alexander, who loves and collects penguin art. The second photo you can see that I am sitting on a messy sofa with more supplies by my feet and you can see the top of my husband's guitar (which he put down to take these photos). I have a sheet I put on the sofa to keep pencil dust from destroying the beautiful whiteness of it (who in their right mind purchases a white couch!?! -- especially if they are an artist) and the throw you see propping up the guitar head & neck is what I use to cover my feet when they get cold from the overhead fan (my husband and son are usually hot and I am usually cold). It's great seeing the artist at work.. Great shots, Anthony! I love seeing how other artist work..fantastic pencil holder!